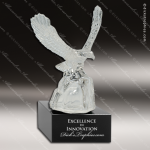 Sculpted from beautiful premier glass in amazing detail, this majestic eagle has a 5" wing span and sits on a 5" square solid black marble base. There is plenty of room to personalize the base to make this the ultimate recognition of excellence. 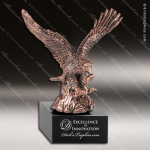 Antique Metallic Bronze Eagle on Black Marble Base. Eagles have been a symbol of majesty and patriotism for over 200 years. 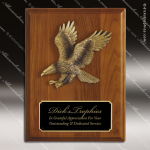 Eagles soar high above the earth and presenting an eagle award to an employee shows that you recognize they have soared high above the rest. Also makes a great achievement award and sales award. Antique Metallic Gold Eagle on Black Marble Base. Eagles have been a symbol of majesty and patriotism for over 200 years. Eagles soar high above the earth and presenting an eagle award to an employee shows that you recognize they have soared high above the rest. Also makes a great achievement award and sales award. 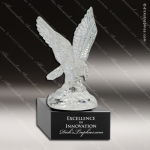 Antique Metallic Silver Eagle on Black Marble Base. 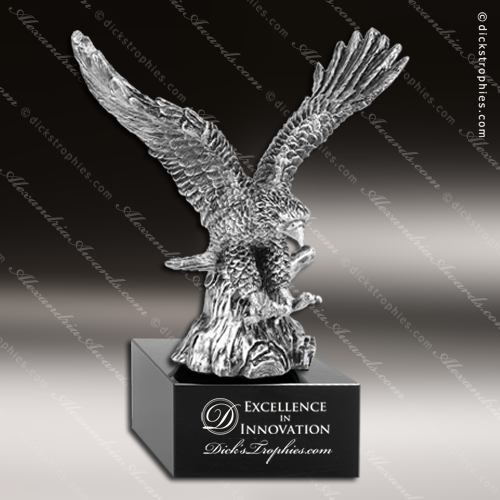 Eagles have been a symbol of majesty and patriotism for over 200 years. Eagles soar high above the earth and presenting an eagle award to an employee shows that you recognize they have soared high above the rest. Also makes a great achievement award and sales award.